I had wanted to make these steamed dumplings a long time ago, but then once I figured that I needed to take the steamer out of the cupboard, I changed my mind. Since I don't steam food that much, I normally hide my steamer in the cupboard so that it doesn't take up valuable counter space. Today, my urge to make these dumplings has overcome such a threshold. 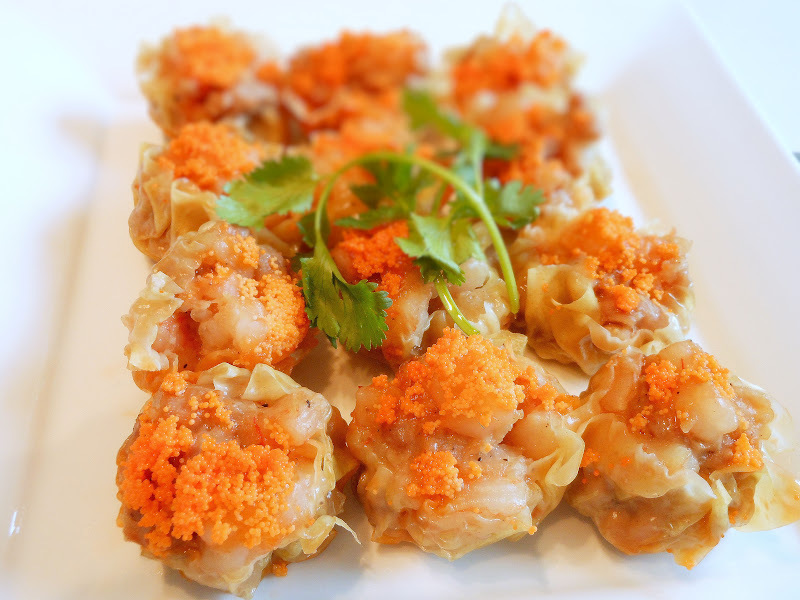 Steamed pork and shrimp dumplings or Siu Mai are served as dim sum in Chinese restaurants. The main ingredients are pork and shrimp or perhaps some black mushroom. My son doesn't like black mushroom, so I usually don't add it to my dishes. I am a big fan of shrimp. I prefer a bit more shrimp than pork in my dumplings. For the wrappers, you can simply buy them at any Asian supermarkets. They are called wonton wrappers. They usually come in squares. However, I find it easier to work with a round shape. A cookie cutter or paring knife can be used to trim off the corners of the square wrappers. Mix shrimp, pork, fish sauce, soy sauce, sesame oil, sugar, black pepper and corn starch together. Trim the wrappers into circles using a round cookie cutter or tip of a paring knife if the wrappers are square. Place 1 tablespoon of pork and shrimp mixture in the center of the wrapper. Bring the edge of the wrapper up and pleat around the filling to form a round shape. Leave the top of the filling exposed. Press the dumpling down to flatten the bottom. Repeat with the rest of the filling and the wrappers. Garnish the dumplings with a little bit of masago caviar on top (optional). Place the dumplings into the steamer. Cover and steam over boiling water for 8 to 10 minutes. How beautiful! Your siumai look just perfect!! Me too, I love shrimp one. It gives nice texture and oh I started to drool! These steamed dumplings are actually a lot easier than what people think. You make mixture, wrap, and steam. I should make this soon. My kids love them!